An instance of this class contains all possible properties of a DVB service. But all properties are optional. They may be set and cleared. Check the availability of a property before getting it. List of possible fields a Service may have set. Can be used as bitfield. DVB service type (as defined in service_descriptor). EIT schedule present (as declared in the SDT). EIT present/following present (as declared in the SDT). CA-controlled (as declared in the SDT). Running status (as declared in the SDT). ATSC service type (as defined in TVCT or CVCT). ATSC major id (as declared in TVCT or CVCT)). ATSC minor id (as declared in TVCT or CVCT)). Constructor using a service id. Constructor using a string description. [in] desc Service description string. If the string evaluates to an integer (decimal or hexa), this is a service id, otherwise this is a service name. Reset using a string description. Check if the Service Id is present. True if the Service Id is present. Clear the Service Id . Get the Service Id . The Service Id or 0 if unset. Set the Service Id . [in] value The Service Id . Check if the Service Id has a given value. [in] value The Service Id to check. True if the Service Id is equal to value. Check if the Transport Stream Id is present. True if the Transport Stream Id is present. Clear the Transport Stream Id . Get the Transport Stream Id . The Transport Stream Id or 0 if unset. Set the Transport Stream Id . [in] value The Transport Stream Id . Check if the Transport Stream Id has a given value. [in] value The Transport Stream Id to check. True if the Transport Stream Id is equal to value. Check if the Original Network Id is present. True if the Original Network Id is present. Clear the Original Network Id . Get the Original Network Id . The Original Network Id or 0 if unset. Set the Original Network Id . [in] value The Original Network Id . Check if the Original Network Id has a given value. [in] value The Original Network Id to check. True if the Original Network Id is equal to value. Check if the Logical Channel Number is present. True if the Logical Channel Number is present. Clear the Logical Channel Number . Get the Logical Channel Number . The Logical Channel Number or 0 if unset. Set the Logical Channel Number . [in] value The Logical Channel Number . Check if the Logical Channel Number has a given value. [in] value The Logical Channel Number to check. True if the Logical Channel Number is equal to value. Check if the PMT PID is present. True if the PMT PID is present. Clear the PMT PID . Get the PMT PID . The PMT PID or PID_NULL if unset. Set the PMT PID . [in] value The PMT PID . Check if the PMT PID has a given value. [in] value The PMT PID to check. True if the PMT PID is equal to value. Check if the DVB service type (as declared in service_descriptor) is present. True if the DVB service type (as declared in service_descriptor) is present. Clear the DVB service type (as declared in service_descriptor) . Get the DVB service type (as declared in service_descriptor) . The DVB service type (as declared in service_descriptor) or 0 if unset. Set the DVB service type (as declared in service_descriptor) . [in] value The DVB service type (as declared in service_descriptor) . Check if the DVB service type (as declared in service_descriptor) has a given value. [in] value The DVB service type (as declared in service_descriptor) to check. True if the DVB service type (as declared in service_descriptor) is equal to value. Check if the ATSC service type (as declared in TVCT or CVCT) is present. True if the ATSC service type (as declared in TVCT or CVCT) is present. Clear the ATSC service type (as declared in TVCT or CVCT) . Get the ATSC service type (as declared in TVCT or CVCT) . The ATSC service type (as declared in TVCT or CVCT) or 0 if unset. Set the ATSC service type (as declared in TVCT or CVCT) . [in] value The ATSC service type (as declared in TVCT or CVCT) . Check if the ATSC service type (as declared in TVCT or CVCT) has a given value. [in] value The ATSC service type (as declared in TVCT or CVCT) to check. True if the ATSC service type (as declared in TVCT or CVCT) is equal to value. Check if the Running status (as declared in the SDT) is present. True if the Running status (as declared in the SDT) is present. Clear the Running status (as declared in the SDT) . Get the Running status (as declared in the SDT) . The Running status (as declared in the SDT) or 0 if unset. Set the Running status (as declared in the SDT) . [in] value The Running status (as declared in the SDT) . Check if the Running status (as declared in the SDT) has a given value. [in] value The Running status (as declared in the SDT) to check. True if the Running status (as declared in the SDT) is equal to value. Check if the EIT schedule present (as declared in the SDT) is present. True if the EIT schedule present (as declared in the SDT) is present. Clear the EIT schedule present (as declared in the SDT) . Get the EIT schedule present (as declared in the SDT) . The EIT schedule present (as declared in the SDT) or false if unset. Set the EIT schedule present (as declared in the SDT) . [in] value The EIT schedule present (as declared in the SDT) . Check if the EIT schedule present (as declared in the SDT) has a given value. [in] value The EIT schedule present (as declared in the SDT) to check. True if the EIT schedule present (as declared in the SDT) is equal to value. Check if the EIT present/following present (as declared in the SDT) is present. True if the EIT present/following present (as declared in the SDT) is present. Clear the EIT present/following present (as declared in the SDT) . Get the EIT present/following present (as declared in the SDT) . The EIT present/following present (as declared in the SDT) or false if unset. Set the EIT present/following present (as declared in the SDT) . [in] value The EIT present/following present (as declared in the SDT) . Check if the EIT present/following present (as declared in the SDT) has a given value. [in] value The EIT present/following present (as declared in the SDT) to check. True if the EIT present/following present (as declared in the SDT) is equal to value. Check if the CA-controlled (as declared in the SDT) is present. True if the CA-controlled (as declared in the SDT) is present. Clear the CA-controlled (as declared in the SDT) . Get the CA-controlled (as declared in the SDT) . The CA-controlled (as declared in the SDT) or false if unset. Set the CA-controlled (as declared in the SDT) . [in] value The CA-controlled (as declared in the SDT) . Check if the CA-controlled (as declared in the SDT) has a given value. [in] value The CA-controlled (as declared in the SDT) to check. True if the CA-controlled (as declared in the SDT) is equal to value. Check if the ATSC major id (as declared in TVCT or CVCT) is present. True if the ATSC major id (as declared in TVCT or CVCT) is present. Clear the ATSC major id (as declared in TVCT or CVCT) . Get the ATSC major id (as declared in TVCT or CVCT) . The ATSC major id (as declared in TVCT or CVCT) or 0 if unset. Set the ATSC major id (as declared in TVCT or CVCT) . [in] value The ATSC major id (as declared in TVCT or CVCT) . Check if the ATSC major id (as declared in TVCT or CVCT) has a given value. [in] value The ATSC major id (as declared in TVCT or CVCT) to check. True if the ATSC major id (as declared in TVCT or CVCT) is equal to value. Check if the Service Name is present. True if the Service Name is present. Clear the Service Name . Get the Service Name . The Service Name or UString() if unset. Set the Service Name . [in] value The Service Name . Check if the Service Name has a given value. [in] value The Service Name to check. True if the Service Name is similar to value, case insensitive and ignoring blanks. Check if the Provider Name is present. True if the Provider Name is present. Clear the Provider Name . Get the Provider Name . The Provider Name or UString() if unset. Set the Provider Name . [in] value The Provider Name . Check if the Provider Name has a given value. [in] value The Provider Name to check. True if the Provider Name is similar to value, case insensitive and ignoring blanks. Get the list of fields which are set in a Service. The list of fields which are set in a Service as an or'ed mask of ServiceField values. Sorting criterion method, used by std::sort(). Sort order: LCN, ONId, TSId, Id, name, provider, type, PMT PID. If both objects have a given field set, sort according to this field. If only one object has this field set, it comes first. If none of the two objects have this field set, use to next criterion. True is s1 is logically less than s2, false otherwise. Sort order: name, provider, LCN, ONId, TSId, Id, type, PMT PID. Sort order: ONId, TSId, Id, type, name, provider, LCN, PMT PID. 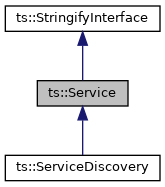 Display a container of services, one line per service. ITERATOR An iterator class in the container. [in] margin The string to print as left margin. [in] begin Iterator to the first object to display. [in] end Iterator after the last object to display. [in] header If true, display a header line first. [in] container Container of services to display.